One of the most adored wedding motifs of today is the vintage-inspired theme. And the perfect ambiance to match this theme can be achieved with a vineyard wedding. There is something fresh, unique, and romantic about vineyards. The air smells of sentimentality – just the right “feel-good” atmosphere for a lovely vintage-themed celebration. Here are some ways you can create that love story in your very own vineyard wedding. Choosing your wedding wine can be tricky. That is why most couples go for the common favourites of their guests. Since you are holding your event in the Hunter Valley, you are at an advantage. You have immediate access to test and taste the fine wine of the valley and determine what to offer your guests. 5. 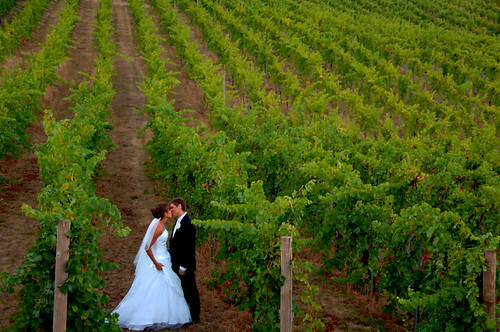 Choosing a vineyard for your wedding venue. Some vineyards are very busy with sometimes more than one party, not to mention a busy cellar door. However, Sandy Creek Vineyard will ensure you of a wedding which is private and available just for you and you’re wedding guests for more information phone 1300 85 80 90.